This 1:12 scale beginners dolls house table project takes it’s inspiration from traditional camp furniture, made in the Adirondack and Rustic styles. It can be sized to fit any scale dollhouse. This type of furniture was very popular from 1860 through to 1930 and remains a feature of remote cabins today. Build with what you have should be the motto of this furniture style. That will be the motto for the twig table design in the following pages. No two will be alike, and all should be built with materials you can find to suit your personal project. This particular table is designed for a rustic front porch , so it has seen several seasons of outdoor weathering, and its finish is a little shabby to say the least! If you want to create a well loved lodge interior rather than a front porch, use the same technique but make the project less shabby. There are instructions for a set of matching twig chairs as well. 6- eight inches of similar diameter straight twigs. A 2 inch square of 3/32 (2.5 mm) aircraft plywood, or basswood. Two, 2/14 inch square pieces of brown cardstock or cover stock paper. Several pieces of narrow dried grass. (I used dried Phalaris grass from the craft store dried flower dept, using only the narrow pieces below the top seed head). You could substitute pieces of wire or stiffened crochet thread, or thin toothpicks if you can’t find a suitable dried grass for step 4. Acrylic paint (the color of your chosen twigs). Semi gloss acrylic finish for the table top. Bright green and beige chalk to make lichen. PVA (white) or wood glue. I chose the Japanese plum branches because they have a lot of short nodes on them, which resemble thicker limbs from larger trees. You can get different effect depending on which wood you choose, but use dead wood. If the wood is green when you build this table, it will shrink as it dries and your table will warp. Dead branches on the tree are fine, as long as they died due to age or weather and not insect infestation! Take some extra pieces of matching straight wood back to your workshop as well, you may need it to brace your legs or edge your table. I intentionally chose wood with natural lichens on it. This will give my table the look it would achieve if it had stood out on a porch for several years. If you want a more formal table, choose wood with less lichen, and fewer joints. Cut a two inch square piece of 3/32 (2.5mm) birch aircraft plywood or basswood to use as a miniature table top. This will create a 1:12 or standard dolls house scale table. Adjust the size for a different scale if you wish. Sand the edges but leave them square. Cut two slightly larger squares (2 ¼ inches) from cardstock or cover stock paper (preferably dark brown). These will be the base for the mosaic twig pattern formed in step 6. Trim your twigs so that one side of a Y joins will be supporting the miniature dolls house table top from underneath. There should be two of these on one edge of the table top so that the underneath supports match on one side, and its opposite side. The other two edges of the table top will not be supported from underneath. Cut the join so that one side of the y fits under the table top reaching towards the Y coming from the other side, and the other side of the y goes up the outside edge of the top ,more or less above the leg. Don’t cut the outside piece of the y (the one that is outside the table top). It will help support the top while the glue dries and it can be trimmed off later. Do not cut the legs to length yet! When you have the y joins cut to fit, glue them so one side of the y reaches under the table top and the other side cradles the top outside edge of the table. Turn the table top over and push the outside edges of the y joins down into a piece of florist’s foam so they brace the table top and hold the rest of the branch (table leg) in place. Start with two on one side, and when the glue is dry, do the other two legs. When all the legs have been glued to the table top, cut the tops of the outside Y shapes flush with the top of the table. With your table resting on its’ top with the legs in the air, measure 2 ½ inches from the top to the leg and cut it to length. Do the same with the other legs. Turn the table right side up and check to see if the legs are square. If not, adjust the leg length on the longest leg. Pruning shears work well for cutting the twigs to length. If your miniature table is wobbly, use some of your extra twigs and cut and glue cross braces half way up the legs, forming an x as they cross in the centre of the table. Glue the twigs together where they join at the cross. Hold the join in place with a piece of string or thread until the glue dries to make sure your dolls house table will be sturdy. While the miniature table legs are drying to the top, you can prepare the mosaic twig top for your dolls house table. Take the paper squares you cut in Step 3 and cut several lengths of narrow grass stems to a size slightly longer than the paper. Glue four or five lengths of grass at a time to the paper, keeping the grass tight together to form an even surface. (see photo). When both paper squares are covered, set them aside for the glue to dry. When the glue has dried, paint the grass with a coat of acrylic paint to match the legs of your table. Set aside to dry. When the paint has dried, cut the squares of grass/paper across the diagonal to form four triangular shapes from each square. Choose four squares with the same grass pattern (either up and down, or across) to be the surface for your table. To form the miniature table top, glue a piece of the grass stem you used in step 6 across the diagonal of the table (don’t trim it to length yet). Now lay out your chosen triangles from step 6 to form the pattern for the dolls house table top. When you have the triangles so that they fit roughly in place, glue them to the table top leaving space for two pieces of grass to form a second diagonal line to make an X across the top of the table. Set the table aside to dry. When the miniature table top has dried in place, cut four thicker lengths of grass to use to finish the outside edge of the table top. They will cover up the hollow grass stems which are otherwise exposed. You want the top to look like it is a mosaic made of twigs. Glue the grass stems along the outside edge of the mosaic you formed in step 7. If your twigs are a suitable size and scale for edging a dolls house table, you can substitute pieces of twig for the grass. Set aside to dry. Paint the trim and the X you formed in step 7 to match the rest of the table top. If there are any gaps between the trim and the table top, fill them before you paint. Make sure none of the plywood/basswood table top is exposed. Paint it to match if necessary. When the paint from step 8 has dried, coat the miniature table top with a semi gloss acrylic to make the surface easier to keep dust free. This is especially important if the table will be part of a dolls house display! When the finish is at the tacky stage, use a small chalk applicator to dab small irregular patches of bright green and beige chalk (from a scrapbook supplier) on the table to mimic lichen. Leave the table top to dry. 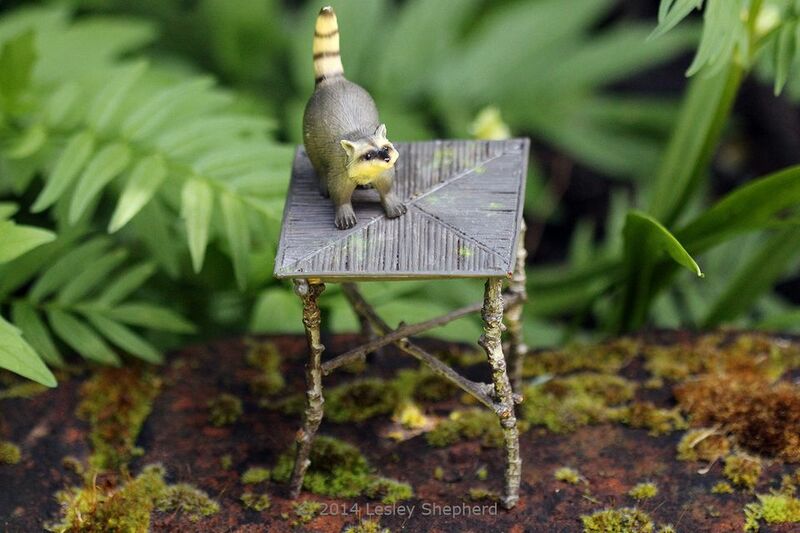 Sit back and admire your authentic Rustic table in miniature. Tables like this were very popular in garden features on large estates during the early years of Queen Victoria’s reign. They moved into the area of Tramp and Adirondack furniture during the last part of the 1800’s and are still a fixture of many remote cabins (and expensive lodges) today. This table makes a great feature on the Dolls House Cabin Front Porch.